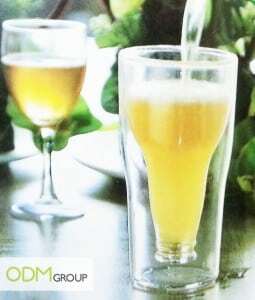 A glass is a common drink ware used for meals, parties and etc. Besides that, they are quite a commonly used as a promotional product. These glasswares come in a wide range of colours and styles to make them most incredible advertising tool for any business. To allow your brand to stand out in this competitive business environment you should choose a unique promotional product to leave a strong impression on your target market. Here is an interesting gift with purchase idea to consider – a bottle in a glass. This adds a twist to any common glassware! At first sight, this gift with purchase would definitely be a very interesting one. It has the ability to draw attention and potentially make customers turn back to have a good look at it. Who would have thought there would be a bottle in a glass? Well check out below to have a good look at this peculiar gift with purchase! How to boost sales with this gift with purchase? The term”gift with purchase” often entice costumers to purchase your products. Customers usually go for buys that seem to be a good deal. This is a typical consumer behaviour. They would go for any products that offers a complimentary gift with purchase as these items are considered an extra bonus. This bottle in a glass is a great gift with purchase. It has a high ornamental and utility value. Its unique design also gives it a higher perceived value. Original and innovative promotional items like this often act as a great incentive. Therefore, to outrun your competitors it is important to select a gift that is capable of creating a lasting impression. Furthermore, a gift with purchase has to be eye-catching. For example, to have a bottle inner shape in a glass is massively eye-catching. It is an interesting product that has the ability to attract attention and encourage customers to purchase your products. This is an inexpensive way to draw attention to your business which in turns generates more sales for the company. So hurry up and get started with this promotion today!